Notebook and entry based information manager. Is there a better alternative to Journler? Is Journler really the best app in Personal Info Managers category? Will Journler work good on macOS 10.13.4? 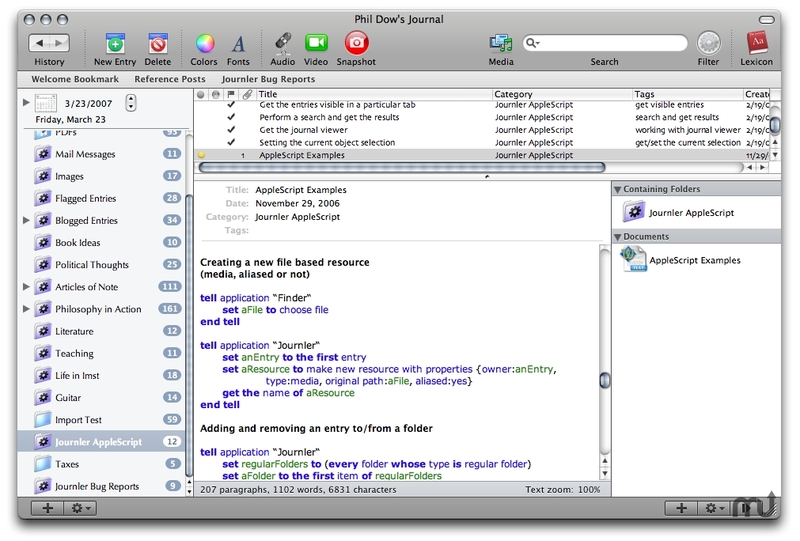 Journler is a notebook and entry based information manager. It is simple, it is elegant, it is powerful. Journler is designed to unite text and media in creative endeavor. It offers a place to store your thoughts and ideas while connecting them with media of any kind. This update includes a Quickfix beta 3 I posted last week after Apple rolled out an iTunes update which Journler's media browser was not compatible with as well as beta 4 changes which fix a serious problem with searching under certain circumstances. Journler's inline media viewer supports audio-video, images, PDFs, WebArchives, websites, email and Address Book contacts. When you're ready to organize, Journler does entries by date and folder as well tiered folders and smart families with auto-tagging. Journler includes lightning search and on the fly filtering of your entries. There is Spotlight and AppleScript support as well as Mail, iWeb, iPod, and blogging integration. The new Drop Box and JPanel make it easy to get stuff in, while the Lexicon helps you find the relationships between your data. Chronicle. Organize. Find. Connect. Journaling is just the beginning.